The Philosophy Department is located in the Social Sciences and Humanities Building. 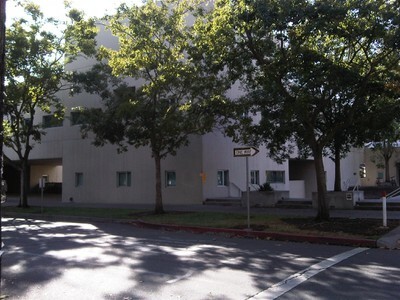 The UC Davis Philosophy Department is located in the Social Science and Humanities Building, along A Street on the eastern edge of campus. This irregularly-shape building is the largest structure in the area, with two sloped five-story towers sheathed in aluminum. 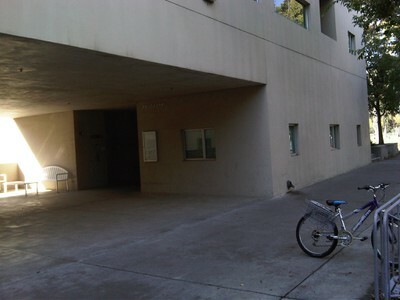 Department offices are in the tan stucco wing on the northeast corner, bordered by A Street and the bicycle path that connects North Quad and Third Street. The main entrance is through the glass door on A Street. 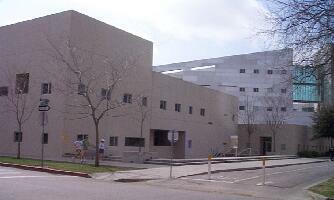 The department office is on the first floor, and most faculty offices are on the second floor. The building opens early in the morning and closes shortly after 5:00 P.M.
Those approaching from on campus will do best to follow the bicycle path extension of North Quad to the end of the building and turn right just past steps to the lower level. From downtown Davis on foot or cycle, take any of First through Third Streets west to A Street. By car, take First or Second Street west to A Street. From I-80 East, exit at the UC Davis exit and take Old Davis Road to A Street. From I-80 West, exit at Richards Boulevard. Turn right and go under the tunnel. Turn left at First Street (the first street) and proceed to A Street. Visitors may park for a fee in the public lots on campus. The nearest public lot is located on Howard Way, just south of Russell Boulevard. A Street is one-way going north and Third Street is blocked off in a way that provides limited access. There is 15-minute parking next to the building and five one-hour spaces on A Street. All other spaces are reserved for residents of the neighborhood. Beginning at B Street and extending to downtown, two-hour parking is available. Parking regulations are strictly enforced by both the City of Davis and the University of California. Parking near the department is free on weekends and holidays. For more information, see the Transportation and Parking Services site. There are several bicycle racks just outside the department offices. UC Davis police occasionally warn or cite bicyclists whose vehicles do not have a current California license. Motorcycle parking is available on Third Street, just east of A Street.